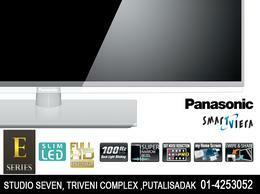 Have a long weekend to spare? Sick of the city? Bandhs getting you down? 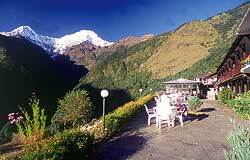 Then the Annapurna Base Camp (ABC) trek is the big break you are looking for. You can do it in a week, but it may be advisable to budget about 10 days for the roundtrip to the sanctuary since spring is avalanche season, and there may be detours. Unlike other treks, you see mountains from the moment you start walking and the view never goes away. This makes the ABC trek's reward-to-pain ratio extremely high. The first day is a gruelling, relentlessly steep climb from Naya Pul (trek start point near Pokhara) to the Ghandruk Guest House, the highest point within Ghandruk, perched on a ridge with glorious views of Annapurna South and Hiunchuli. Lace-thin pancakes with honey, and mashed potatoes with lemon give you a much-needed energy boost the second morning, as you plunge down to the Modi Khola river basin and struggle up to Chhomrong at 2,060m. This is the great Himalayan rollercoster, also known as Newton's Fourth Law of Trekking: Every step downhill must be followed by an equal and opposite step uphill. 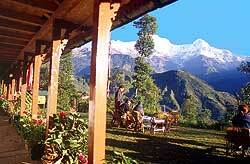 Mountain View Lodge, just before the popular Captain\'s Lodge has a fantastic set of triple rooms designed like a solarium with 180 degree views of Annapurna South, Hiunchuli and Machapuchre. After hot showers, you relax on the terrace with cans of beer and mouthwatering chili potatoes, looking directly down at the valley you will be trekking through in the coming days. Another great bonus of this trek is that it shows you exactly where you\'re going, unlike other treks that tend to be linear or circuitous, this one simply weaves through the green hills in front of you. 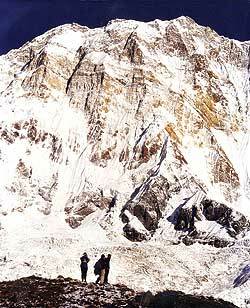 There is the incredible hulk of Annapurna South Face, and you think that the night after next, you will actually be at its base. And there is the ever-present forked spire of Machapuchre that looks completely different from the standard postcard view from Pokhara. Chhomrong to Himalayan Hotel is another long day, with a lunch stop at Bamboo\'s German Bakery, which boasts a fat cat, coffee and cinnamon rolls. You walk through dense rhododendron forest and strands of bamboo most of the day, where the trail clings to the side of a steep flank of Hiunchuli. Himalayan Hotel at 2,900m is a place deep in the shadows of a narrow ravine, with no mountain views, and just a couple of hotels. This is Gurung country and the villagers love to serenade and dance in the evenings by the light of the moon. 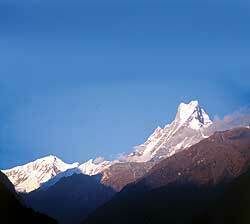 You get up early the next morning to get some sun and see the glaciers on Machapuchre\'s western side. After the initial burst of energy, your progress will slow since the day's total height gain will be over 1,200m. Some trekkers break this down into two days, especially if they are feeling the altitude. You make a brief stopover at Deurali where you fortify yourself with hot lemon drinks and garlic noodle soup, before braving the avalanche prone stretch of the trail that lies ahead. There is a small shrine to an Australian family killed by an avalanche here two years ago. The porters had worried looks, and you don't feel like lingering in this gully that funnels everything that falls off Annapurna South to the valley below. The avalanches come without warning, and there is an eerie emptiness to this part of the trail, broken only by the thudding noise of a trekker from New Zealand travelling through the trail at breakneck speed. In answer to astonished looks, the long distance runner who trains regularly in the mountains at home, says he is 'running' up to ABC instead of just walking. 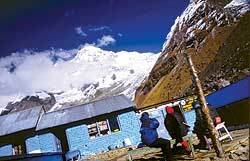 At 3,700m on Machapuchre Base Camp (MBC) there is mountain goat curry and dal-bhat. You are now above the treeline and plod up the barren moor-like landscape, walking along an icy river up to ABC. This last part of the day is less than 400m gain in altitude, but being over 4,000m now begins to make each step a bit of an effort. All the while, the magnificent vertical wall of Annapurna I looms over the northern horizon. By around four in the afternoon you finally clamber wearily up to a small cluster of lodges and make your way to Paradise Lodge. You look at the ring of jagged ice peaks of the sanctuary over a hot cup of tea and realise that it was all worth it. This is often said, but we must say it again: there really is no mountain view quite like this. One feels an amazing sense of being within, rather than looking at-this really is the very heart of the mountains, and you feel like a trespasser who has come too far. Looking back towards the mouth of the ravine to the south at the silouhette of Machapuchre, Annapurna III and the beautifully smooth flanks of Gangapurna, it is strange to see Annapurna South, that familiar mountain that accompanies you from the very beginning of the trek, from behind. After glorious sunset view photographs are taken, the temperature drops immediately to around minus 4 degree Celsius. Morning brings an almost other-worldly stillness and beauty as you stand on the edge of a glacier looking around at the panorama of peaks. Tent Peak, Fang and Roc Noir are interesting, but all else is dwarfed by the magnificent Annapurna I and the north face of Annapurna South. We relaxed till about 11, breakfasting on pancake after pancake until sadly, it was time to go. Leaving ABC is difficult because it is virtually impossible not to keep turning one\'s head for one last look at this incredible place. Back down to Himalaya for the night, and then up the dreaded climb to Chomrong, which passes quickly in anticipation of the best hot shower in the region. 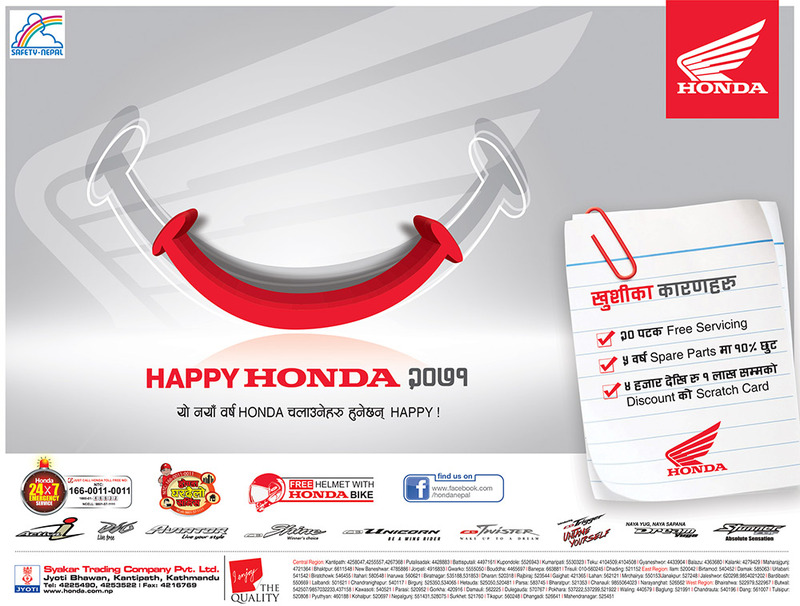 Depending on how eager you are to return to bandh-bound Kathmandu, you can manage Chomrong to Pokhara in a day, taking an alternative route past Jhinu Danda hot springs straight down the Modi Khola and back to Naya Pul. If you have a week, grab your backpack and a good sleeping bag-and just do it.